ZigBee/IEEE 802.15.4 addresses three typical traffic types. IEEE 802.15.4 MAC can accommodate all the types. 1. Data is periodic. The application dictates the rate, and the sensor activates, checks for data and deactivates. 2. Data is intermittent. The application, or other stimulus, determines the rate, as in the case of say smoke detectors. 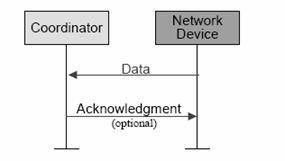 The device needs to connect to the network only when communication is necessitated. This type enables optimum saving on energy. 3. Data is repetitive, and the rate is fixed a priori. Depending on allotted time slots, called GTS (guaranteed time slot), devices operate for fixed durations. ZigBee employs either of two modes, beacon or non-beacon to enable the to-and-fro data traffic. Beacon mode is used when the coordinator runs on batteries and thus offers maximum power savings, whereas the non-beacon mode finds favour when the coordinator is mains-powered. In the beacon mode, a device watches out for the coordinator's beacon that gets transmitted at periodically, locks on and looks for messages addressed to it. 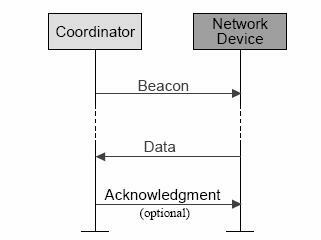 If message transmission is complete, the coordinator dictates a schedule for the next beacon so that the device ‘goes to sleep'; in fact, the coordinator itself switches to sleep mode. While using the beacon mode, all the devices in a mesh network know when to communicate with each other. In this mode, necessarily, the timing circuits have to be quite accurate, or wake up sooner to be sure not to miss the beacon. This in turn means an increase in power consumption by the coordinator's receiver, entailing an optimal increase in costs. The non-beacon mode will be included in a system where devices are ‘asleep' nearly always, as in smoke detectors and burglar alarms. The devices wake up and confirm their continued presence in the network at random intervals. On detection of activity, the sensors ‘spring to attention', as it were, and transmit to the ever-waiting coordinator's receiver (since it is mains-powered). However, there is the remotest of chances that a sensor finds the channel busy, in which case the receiver unfortunately would ‘miss a call'.